Make sure your “extreme coupon” hobby remains productive by watching for any of the following signs. If your coupon collection has outgrown the space you have available to keep track of it then it might be countproductive. Ditto for any kind of disorganization that either requires you to spend a lot of time looking for the coupons you need. The same also goes for retaining coupons beyond their expiration date. Organize your coupons in file system that makes them easy to find and also easy to purge as soon as they expire. Don’t hang onto expired coupons, as there’s no benefit to retaining discarded coupons. Do you seem to be spending more money even though you collect and redeem coupons? Has your stockpile outgrown your ability to store it? A “yes” answer could mean you’re buying more than you need. Coupon issuers will never admit to this publicly but their objectives include getting you to purchase more than you otherwise would have. The most egregious of these require you to spend a minimum amount in order to save — like buy $25 in order to get $5 off. If the promise of $5 gets you to spend $25 that you otherwise weren’t planning to spend, maybe this type of coupon isn’t really saving you any money. Then there’s getting one free if you buy two or more of something perishable — if the extras might go bad before you have time to consume them, don’t clip this type of coupon anymore. Do you find that couponing results in you having less time to do some of the things you enjoy most? Are you buying newspapers you previously weren’t interested in just so you could clip the coupons? Do your wrists or hands ever hurt from using scissors so often? 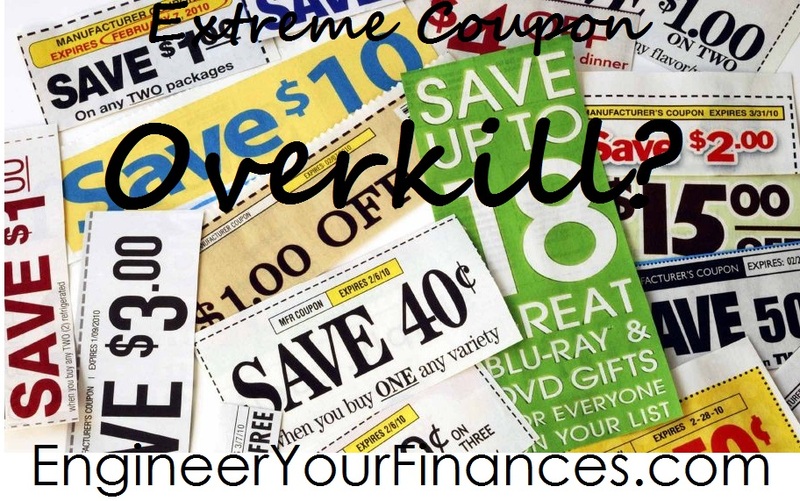 Answer “yes” to any of those questions and you might want to consider ways to streamline your couponing hobby. Try automating the process using coupon apps for your mobile device. This will save you time and keep from getting carpal tunnel syndrome. Many retail coupons are made available in both electronic format and print, but the latter never includes any email reminders, let alone the ability search by keyword for things you actually need. Speaking of traveling to stores to redeem coupons, it’s one thing to drive to a nearby location but once that becomes a longer trip you have to factor in gas money. The more you travel to distant stores to redeem coupons, the greater the likelihood that you’re canceling out any savings by spending more for gas. Think twice before saving and redeeming coupons for stores that are out of your way. Has your diet changed since you started couponing? Are you eating more processed foods than you were before? If so, you might be redeeming too many coupons that are actually bad for your health. There are coupons for health food, including low calorie items and organic produce — you just have to look harder to find them. Or be willing to accept that you might not be able to redeem coupons for absolutely everything. The need for acceptance becomes clearer if you see any of the other phenomena mentioned in this article. If any of the signs mentioned above describe your own habits, you might need to change your coupon strategies. And if you also recognize these traits in someone else’s couponing hobby, you might want to share this post with him or her. Readers, do any of these signs remind you of someone you know?